With our first printmaking workshop coming up, we thought we’d take a moment to consider: what’s so feminist about printmaking? Glad you asked! Printmaking is an image-making process loosely defined as “the process of making pictures or designs by printing them from specially prepared plates or blocks”. Whether a block of wood is carved, metal type pieces are individually shaped into letters and combined together to form words, or a screen is drawn on and sectioned off with blocking agents, the nature of the medium is to produce multiples. Whatever the block or plate, referred to as a matrix in the print world, may be made of, the intention of the medium is to repeat the inking and printing process to create many prints of a single work. Independent magazines, referred to as zines, have long been utilized by feminists to spread feminist theory, organize communities, and rally support, among many other things. Zines can exist in a variety of forms (one-off collections of information or as ongoing series’ and editions) and can be created using any number of print mediums (screen printing, letterpress, Xerox). No matter what print media is used to create them, the ease of making multiples with print has helped spread zines far and wide. Zines remain a regular staple in intersectional feminism today — ask us about our feminist propaganda the next time you’re at a Feminist Oasis event and we’ll show you our zine! Initially organizing in the late 1980s, the Guerilla Girls have been calling attention to the systemic racism and sexism within the art market, galleries and museums for over two decades. Their projects focus on undermining “…the idea of a mainstream narrative by revealing the understory, the subtext, the overlooked, and the downright unfair.” Their projects have included countless mediums and performances, but their use of Xerox prints as street art is a notable example of how feminists have utilized print to spread imagery and facts. With the most recent edition having been published in 2011, this women’s health guide began as a 193-page stapled booklet in 1970. 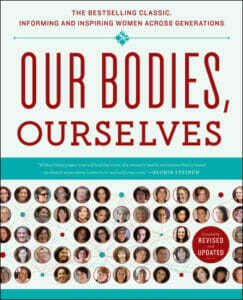 Women’s bodies have long been politicised and paternalized, so when a group of feminists held a discussion on the female body ranging from personal stories to medical experiences they had had with doctors, it was revolutionary. The conversation grew and the feminists organized, bringing together a group of doctors to research what they were learning about their bodies and health. 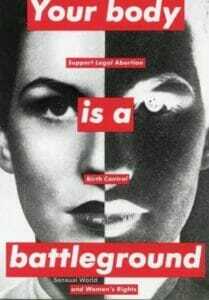 The information that was collected, printed and shared in the original booklet spanned a wide range of topics, including abortion, which was illegal at the time. This printed booklet, and the genuine conversations that led to it, broke taboos and educated countless women on their bodies’ wellbeing and autonomy. 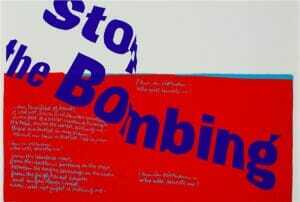 Mary Corita Kent, used printmaking as a vehicle to advocate for the end of poverty, racism and injustice. Kent’s work combined advertising imagery and slogan, song lyrics, Bible verses and literature to call attention to the injustices she saw in the world. The affordability and accessibility of print allowed each of these artists to quickly produce and widely distribute work that was intended to comment on current events and cultures. Of course, this blog post does not and cannot speak about all the ways printmaking has been used to inform and grow intersectional feminist thought and resistance. Nor does this history live in a vacuum — feminists continue to utilize this accessible art form to spread information and build community today. This post simply provides an introductory glance into the ways in which this particular medium has given feminists throughout history a platform from which to speak: imagery, narratives, theory, personal disclosures, community organizing; women’s truths. It has all been distributed through print. Need some feminist printmaking in your life? Join us at Chase’s Garage on Saturday, November 17th for a screen printing workshop where you can learn, start to finish, how to make your very own prints! Artist Sarah McCullough will walk participants through the entire process, providing you the information necessary to set up your own work station. This workshop will be hands-on and everyone will spend time mixing ink and pulling prints! The workshop’s lessons will provide practical knowledge and experience while also discussing the close relationship printmaking and intersectional feminism have. Plus, attendees are welcome to bring personal items to print on! Learn more about the event and reserve your spot here — and don’t forget: Members can use their member codes to receive $10 off their tickets!